Are you looking for a 1-bedroom or 2-bedroom apartment in Littleton? Perhaps you’d like something with a loft space? Whatever you’re searching for, we have something to fit the bill at Summit Riverside Apartments. All it takes is a quick look at our various floor plans to see that no matter what your situation, you’ll be able to find something that meets your needs perfectly. Between the many great amenities and the amazing restaurants, coffee shops, and local nightlife nearby, there is plenty to love. Of course you’ll probably want to stay in from time to time and when that’s the case, you’ll want to spend a bit of time relaxing in a bedroom that is nice and cozy. Fortunately for you, we have a few suggestions for how to make your space incredibly comfortable. Keep reading to see our suggestions! Wondering How to Make the Most of Your Bedroom? At Summit Riverside Apartments in Littleton, each floor plan features everything you need to feel at home, but your bedroom is the place you go to unwind at the end of a long day with a relaxing night’s sleep. 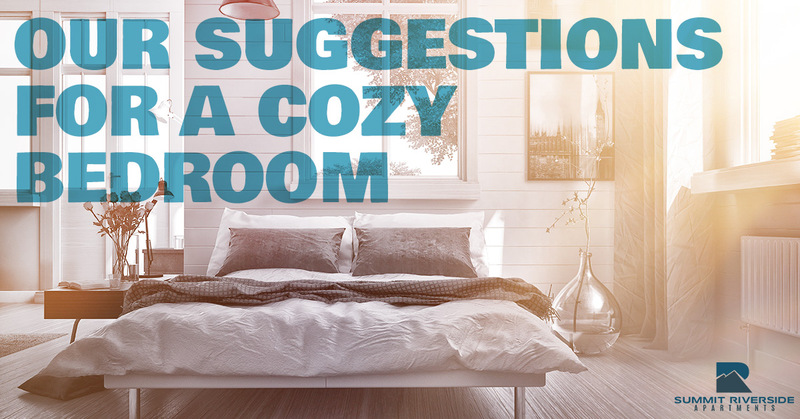 Here are our tips for making it a cozier place. What are some of the things that help you to feel relaxed the most? For many, it’s a photo or two of friends, family members, or loved ones. You could head to the local Walgreens and have a few photos printed from your phone or keep it a little more casual and tape a few instant photos to the wall. One of the absolute best things a person can treat themselves to is some high quality bedding. You don’t know the difference it can make until you try it for yourself! Trust us when we say that the first time you slip into your bed and the sheets are fluffy and soft instead of scratchy and stiff, you’re going to sleep like a baby. Grab a new pillow while you’re at it and you can rest assured that you’ve never had a night’s sleep quite this good. What type of mood are you trying to create in your bedroom? If you want to lay around and read a book, you’ll need a good bedside lamp. On the other hand, if you plan to curl up in bed and watch a movie, you’ll want as little light coming into the room as possible. We won’t tell you which lights you need, but we would advise you to consider how you’ll be using your bedroom primarily and find something that suits your needs. Looking for Apartments For Rent in Littleton? Whether it’s a 1-bedroom apartment, a studio, a 2-bedroom with a loft, or something else, you’re sure to find the perfect space to live when you look to Summit Riverside Apartments. If you’re just starting your apartment search, save yourself some time and request a tour today. We think you’ll love what you see!